I haven't finished a 100K in 2013. I just had to do something about that. 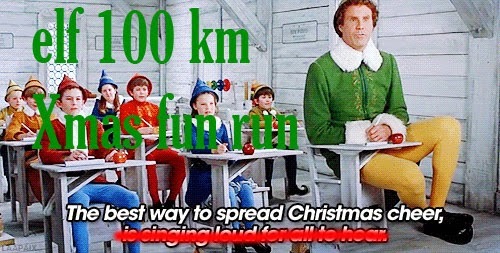 That's how Elf 100 km Xmas fun run was born out of the blue. There were no other runners in this event. Most convenient for me was to run a nice and easy 25 km loop around my neighbourhood four times. There would be 200m ascent per loop. I started to run 8:00AM on Monday, December 23th. It was still dark, but I knew there would be streetlights along the way. Almost all of the route was on dirt paths in a delightful natural setting. Less than 10% was covered with asphalt. Bicycles were the only traffic to look out for. The weather was balmy 5˚C with lots of showers. Air humidity was around 80-90%. We haven't seen a snow-free Christmas like this for years. The sunrise around 10AM was most welcome, but already after 3PM it got dark again. It's the darkest time of the year. Only during loop #2 I was able to enjoy full daylight. I finished at 00:27AM on Tuesday, December 24th. Total time 16h27min. My loop times were 2:52, 3:17. 3:40 and 3:49. Total running time 13h38min. The breaks at home between loops took me 2h49min. 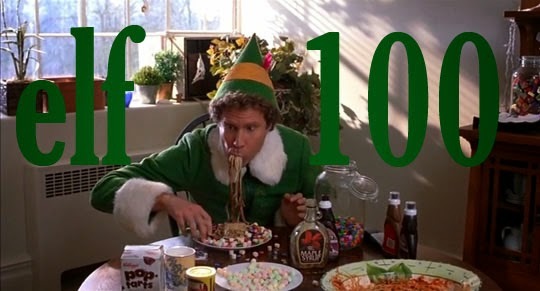 Like a good elf, I made sure to take plenty of time stuffing my face. After finishing I felt good, but a bit tired. Merry Christmas and happy trails 2014! This is awesome TP! Congratulations…you're an animal! Thanks Dreama, just having some fun!